France is considered as a hub of private enterprises. The country is powerhouse of European Union hence many people aspire of relocating to France and gain France citizenship.Immigration to France is possible under varied visas like France tourist visa, France Skills and Talent Permit etc. An independent profession (writer, translator…) which is likely to contribute in one way or another towards the economy, both of France and directly or directly the applicant’s country. The France Skills & Talent Permit allows a person to work and settle in France and become eligible for France PR after 3 consecutive years of stay. Subsequently, the migrant becomes eligible for France citizenship after 5 consecutive years since initial entry. Apart from the Skills & Talent Permit, France Tourist visa is the most demanded visa for French immigration. France tourist visa is issued as a Schengen visa which allows a person to enter all the Schengen declared territories. It is a multiple entry visa and allows a migrant leave France without having to apply again, subject to the duration of stay not exceeding validity of visa. 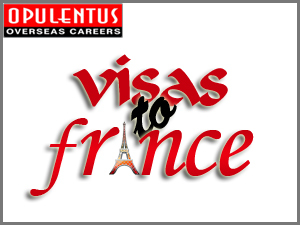 Take services of Opulentus Overseas Careers and start with the process of relocating to France. We have expertise in processing successful visas for France. Whether you are in search of a job in France or want to travel France or want to study in France; we’ll provide you suitable visa solution as per your preference and eligibility. You’ll be suggested a visa only after careful study of your profile has been done and we are sure about your eligibility for the suggested visa. Immigration to France by taking services of Opulentus will not only help you in experiencing a smooth visa process but it will also acquaint you with other value added services. Facilities like airport pick-up and accommodation assistance will be the ready support that you’ll get once you are in France. Also, we’ll assist you in searching a suitable job for you. We’ll circulate your resume to job consultants in France which will help you get a notice amongst all the prospective employers and get a job easily. So, contact us today and migrate to France. We are World’s best immigration consultants for France and have our offices in India, UK, USA, Ireland, Canada and Australia.